Yeah I considered all those factors you guys mentioned but the real clincher for me is I enjoy what I'm doing now why mess with that. Thanks for the responses. Be safe out there old school. And Brett I bet you got some great ridin' in this winter. What I know so far is 90% drop and hook on the pick up end 50% drop/ live unload on drop end. Approx. 2500 to 3000 miles per week and no loading or unloading. Possibly home more often but that's not a big issue for me. I'm aware NE miles/ traffic are tougher and really like otr where most trips are 3 to 4 days just all day rolling along. Living in NH I've encountered some of the traffic on my way to hometime and it's not pretty. My other concern is night driving. I for the most part can run daytime hours otr. If this position requires a lot of night driving or mostly erratic hours then it's not for me. Honestly don't think I want to make any changes right now. Hi folks. Long time. Back at Stevens about 6 weeks solo again and they offered me a New England regional Kraft dedicated job today at .40 cpm. 7cpm more than current pay. Any insight into such a position would be greatly appreciated. Rehired back at Stevens. Long story short...things didn't go as hoped back home and not finishing my commitment didn't sit right with me. Hopefully I can grow to tough it through the lonely times this time. I'm out...OTR not for me. Yeah it would be nice to get paid to play. That's not what influenced my decision though. Thanks Daniel and MM. And Old School I agree with you whole heartedly about work being a part of mans purpose in life and work that animates you and gives you purpose putting it on a spiritual level. I'm not sure what that is for me but I also learned that it's not so much the job I have but the job I do that makes the man. I did once have the fortunate opportunity to take someone for a paid guided hike and thought man I'd love to figure out how to make this a regular living. I guy I met a couple years ago comes to my area in my home state every summer from Manhattan and hires a hiking guide because he's not comfortable going alone and his guide that summer had to bail due to family emergency. He asked if I'd take him and he said he'd pay me and I told him he didn't have to pay me but after much insistance I relented. I Told him I'd take him and he could pay me what he wanted after the hike. After a nice 8 hour hike with several views of the lake and not too technical terrain and a mountain top snack he told me he had the best hike he'd been on and payed the $250 he had planned to pay intially. I drove for Stevens. I am aware of their northeast regional but that didn't interest me either. I was hired 4/5/17. Including training and just over 90 days solo almost 6 months. Not particularly interested in driving at all. Just don't think it's for me in any capacity. Especially OTR. Like I said, I was wrong. Didn't know myself as well as I thought I did. If I have hurt my chances for other driving opportunities should I change my mind then that's the choice I live with and I will make do. It's a good career for the person with the right personality and there is plenty of great oppotunities and one could make a good living at it. 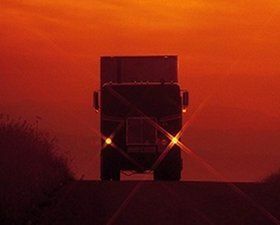 I truly thought I would love OTR truck driving. I thought for sure I would love the solitude. That the long periods of isolation would be enjoyable. I was wrong. I gave it much consideration long before getting into this career and didn't just jump in yet I still was wrong. I had intended to stick it out for the 1st year but I just miss home too much. I found my attitude diving south and try as I might found it very difficult to keep a good attitude and felt that the road is not the place for me and could potentially put others at risk. I have nothing bad to say about the industry or the company I drove for. In fact I was treated well and got great miles and ample hometime. I discovered that home, regular interaction with my community and fellowship are things that are most important to me and help ccontribute to my spiritual well being. The company thanked me for returning the truck and told me I was welcome to return anytime if I change my mind. God bless you all and be safe out there. None. Why would you want to pay somebody so you can work for them? If a company is willing to let you drive their truck, take care of the maintenance, and pay for fuel, while you keep the money you earned doesn't that sound like a better deal? Amazed he got as far as he did without being stopped! Seriously? A boardwalk? For 2 miles? How about a sensor that pops out a flag like the stop sign on the side of a school bus that says "hey fool you're in my blind spot." Prime inc. - lightweight/ Condo and OTR/NorthEast Regional? I've also noticed a lot of shippers and receivers don't allow dogs out of the truck while on their property. That could be very uncomfortable for a dog when sitting for hours. I immediately thought of Wren and Stimpy and the jolly candy like button. Yet had no idea what you were talking about. Now I know. Kenny, I got the same from my first choice. Sounds like the same company. Same response they gave me. I was bummed at first but moved on. You'll get picked no worries. We've all heard the old adage "if it sounds too good to be true, then it probably is." Charlie I've read some posts where people are mentioned as having issues with their DM's and I don't understand why. Maybe it's because I'm new. But I almost never talk to my DM. Occasionally I have to ask a question because I don't yet understand everything. He knows this and is cool to answer them. But other that I just accept my loads, pick them up, and deliver them. When I first started I would deliver a load and then wait for a new trip plan then call because it was taking a long time to get one. Then I started calling before I was finished so I would have a preplan ready after I unloaded. Now I've been getting preplans sent without asking before I get to the receiver. I just added up all my miles from July 3 (when I got assigned to this truck and my first dispatch on it) which is when I got back from hometime after training, and the total was over 15,000 miles. And that was with 5 days hometime in there. Not too shabby I'd say. I asked my DM the other day how I was doing and he burst out laughing. He says "fantastic man. This is how you know if you're doing good. If you don't hear from me, the less you hear from me, that means you're doing great." Basically I just do my job and accept that I don't know squat. My trainer told me "the tug is good, hear the click, man you don't gotta look, it's good." No way, I get my flashlight everytime and crawl under there to look. My thoughts and prayers with you. That Dr. Pepper gig sounds like what I'd like.